The biggest hedge in the world! Planted in 1745. The classic, the original, "sponge on a stick". A postcard beloved by children of all ages. Thank you, Buchhalter. Finally for this delivery, another postcard from yockenthwaite via Inverness, featuring Nessie! Oops. In consulting my M. R. James, which is the only book I have where this term is used, I see it is "groynes". In my part of the US, we call them "jettys". 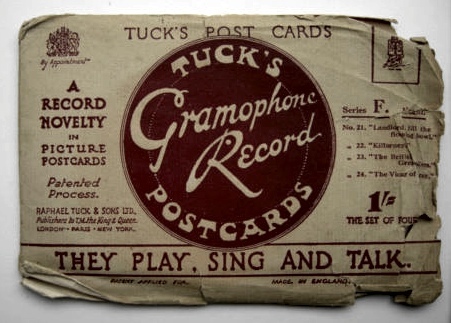 Well, you never know, sometimes the postcards can take an unusually long time! I will keep an eye out for a concrete ship approaching Innsmouth House. So... I recently received our Royal Mail renewal notice for our Post Box and in the past four years it's skyrocketed up from Â£60/year to over Â£300 ($500)/year. If you've already got something in the post to us via the old address we'll still receive it before it's deactivated, but do feel free to start using the new one from the end of the month! I recently sent two cards from the other side of the Atlantic to the old PO Box address so they may take another three or four weeks to reach you. Hopefully they'll be properly delivered inspite of the upcoming address change. The new postal address is working (as evidenced by my test card, below). The addresses will run in tandem until mid-December, after which the Leeds address will remain the active one. Hmm, it appears that "The Silver Fox" is branching out from archaeology and antiquities. Do give my complements to Mrs. Sunderland. I've sent my own test card, so we should soon be able to tell if international mail is working properly. Just in the nick of time (and what I suspect will be one of the last cards to the old postal address). A postcard from "Lobo Domesticado" (see post #131, above) in Mexico City and the Zapotec ruins of Monte AlbÃ¡n near Oaxaca. It's somewhere we'd also like to visit one day. We love receiving and sharing cards from fellow Lovecraftians around the world. P.S. Also, people who'd like recommendations/advice when visiting Oaxaca or Mexico in general, feel free to PM me. - and so it arrives! The last postcard to the old address courtesy of HLD. The new address now takes over as the old one is retired and we receive our first official card at the new location from Beachrubble. Our first postcard for 2014! Viv writes from Fife. Noodles and afternoon teas are in order. We love receiving cards and various missives and sharing them, please do send them along. Ye yoggie counter shows we're approaching 200 so far. Not a postcard received but something I found while sourcing an old guidebook as a gift for my uncle. 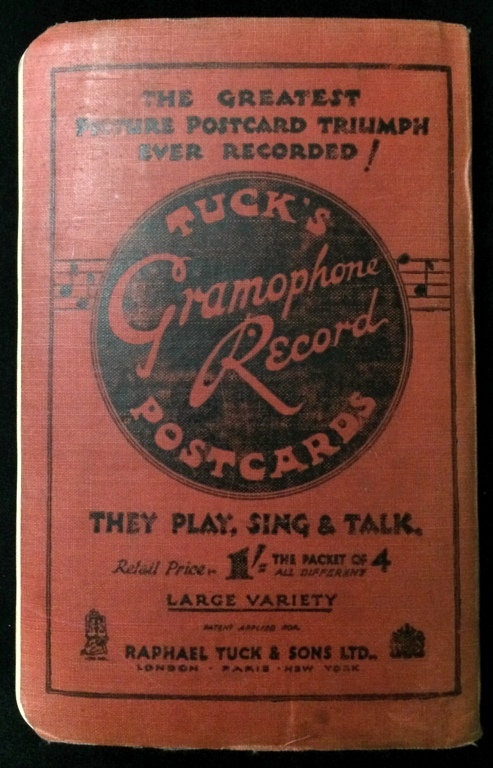 On the back of a Ward, Lock & Co "Red Guide" for Llandudno (1930) was an intriguing advert for "Tuck's Gramophone Record Postcards". This was the first I heard of such a thing, but lo and behold they exist! Certainly possibilities for something like this turning up in your game when the recording on the postcard might be some...thing... the Investigators don't really want to hear. A report from our correspondent, cjearkham. Do feel free to send "Olde Yoggie" a card (especially if you're on your holidays this summer)! We love reading and sharing them. If you're wondering what a "Beeblebear" is, prepare yourself! More postcards, posted. We range the world! William-Tobey feels he's up to the gruelling task of tracking down Great Cthulhu in the Pacific, with a stop-off at the Cook Islands. Meanwhile yockenthwaite reports on the world's oldest printing press in Antwerp (one for keen bookhounds)! We do love receiving your postcards (especially in these days of increasingly digital communication). Why not send us a card and say "Hello"? Buchhalter (Chris) also very kindly helped me set up for the recording of Ramsey Campbell at Liverpool One we did the other year (when Ramsey was launching The Last Revelation of Gla'aki). The two white lines on the front of the card are an artefact of the scanning process. You can see where the image changes over around the knee level. - and do see the Ancient Lives exhibition if you can. It's just been extended for a few more months (April 2015). Hm, I sent you guys another card from Mexico half November last year. Not certain if it is going to arrive at all by now. People in Belgium received my postcard just before christmas, in the Netherlands 1-2 weeks before that. Nothing yet. Will certainly post it here when we receive it! Not certain if it is going to arrive at all by now. Helen is also a big fan of Mexican food! Slartibartfast enjoyed being part of Secret Shoggoth IX last year (and 2015 should see SS X)! Thank you everyone who sends a card. It appears some can take a while to arrive but we've received them from pole to pole (literally) and they usually get here in the end. In this increasingly digital age it's always a welcome sight to receive a good old fashioned card. 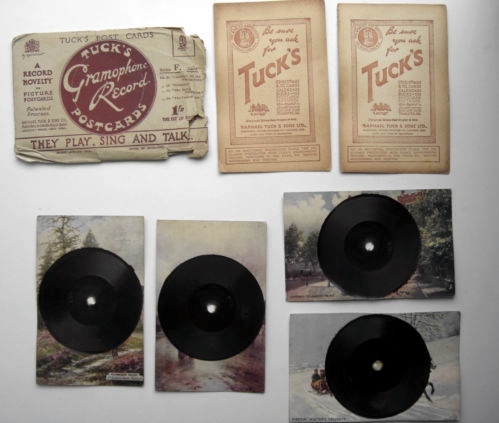 Even though we then end up sharing them digitally (the irony is not lost on us).